From the moment that you enter our light and spacious salon we’re sure that you’ll appreciate our relaxed approach, friendly team and styling chairs that are as comfortable as armchairs. 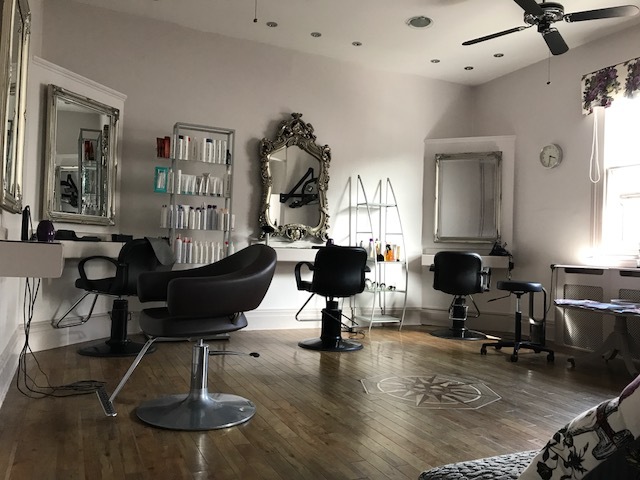 Our contemporary interior fuses vintage styling touches with a vivid colour-scheme and all the equipment you would expect in a modern salon. Whether you visit us for a complete new look or your regular cut and finish, you’ll be attended to by an individual stylist who will spend time discussing your hair, offering you advice, and making styling suggestions if needed. All of our trained stylists have expertise in cutting, styling and colouring, and whilst skillfully attending your hair, they’re always happy to share a chat and a cup of tea. Having trained and worked at some of the top west-end salons, Mike decided to leave the London life behind and in 1990 started Sorsky here in Melton Mowbray. Since then, Mike has taken great pride in providing top quality work and excellent customer service to a longstanding, loyal client base. When Mike’s not styling the townsfolk of Melton he likes nothing more than returning to London for regular ‘shots of inspiration’ at the capitals leading salons.